Arduino Nano 3.0 (or clone) carrier board with Arduino shield breakout, prototyping area and nRF24L01+ headers. Thru-hole components kit. RFX Nano 3.0 carrier board with Arduino shield breakout, prototyping area and nRF24L01+ headers. 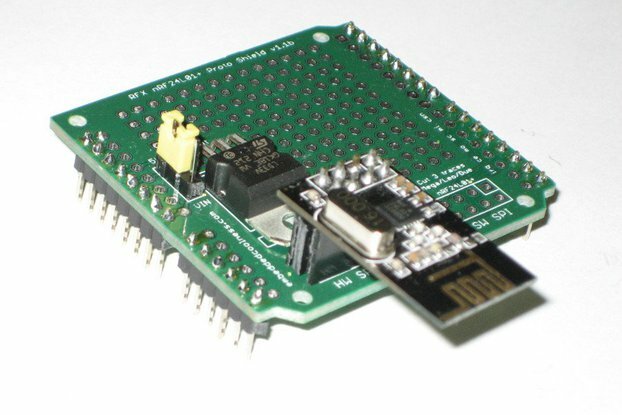 As Nano V3.0 clones can now be bought from ebay for under $4 (or for not much more than a DIP 328p chip), it makes sense to leverage this exceptional bang/buck ratio into a replacement for inexpensive bare-bones 328p deployment boards. And get USB connectivity and two extra analog input pins thrown in for free! This Uno-sized (~7cmx5cm) breakout board for the Arduino Nano 3.0 (5V, 16Mhz) is a convenient way to add nRF24L01+ module and Arduino shield compatibility to a Nano project, as well as providing a general purpose breakout board with built-in prototyping area for the Nano 3.0. 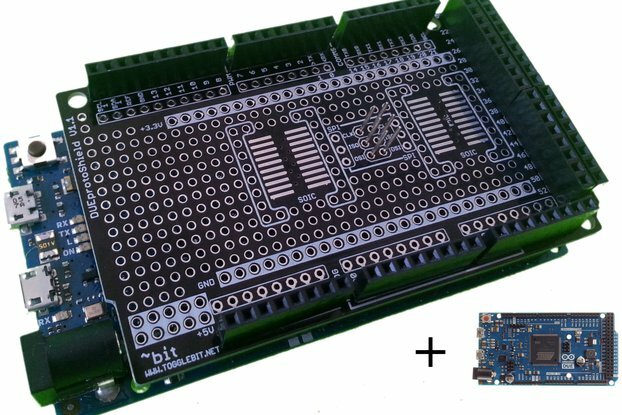 Easy assembly using all through-hole components, so no advanced soldering skills or equipment required to assemble this board. 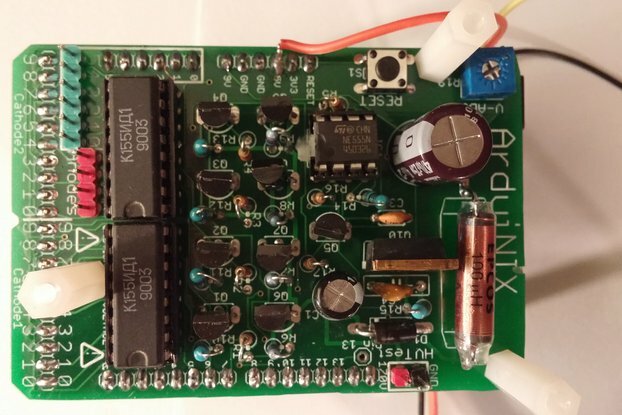 This board was originally designed as part of the Radio For X:duino (RFXduino) project, as a convenient and easy way to add nRF24L01+ module and Arduino shield compatibility to a Nano 3.0 project, as well as providing a general breakout board with built-in prototyping area. 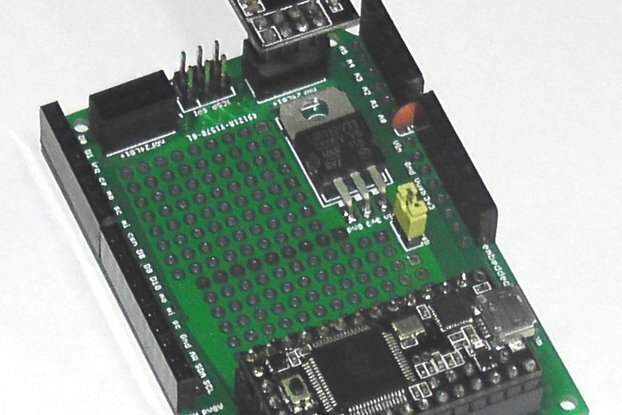 The board's design also makes it useful as a compact general-purpose breakout/prototyping/deployment board for the Nano 3.0, even when the nRF24L01+ radio capability is not required. All Nano pins are broken out on the headers, including the two extra analog input pins A6 and A7 available on the Nano. Alternatively, the 3v3 regulator can be powered directly by e.g., the DC barrel jack connector mounted under the Nano (standard 5/2.1mm size -- refer photos). This has the advantage of bypassing the 500mA USB limitation, if you need higher current available on the 3v3 rail. And the prototyping area gives flexibility for many more possible configurations! 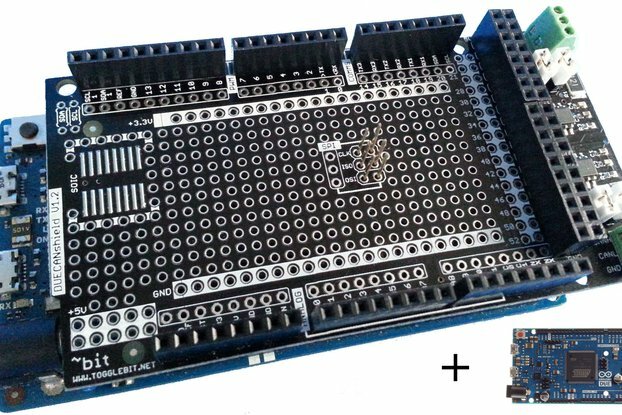 For many Arduino shields, a set of stackable headers will have to be used for the shields to clear the height of the Nano (which is mounted at the same level as a shield). So a set of stackable headers (available as a kit option) is recommended if deploying shields is a consideration. 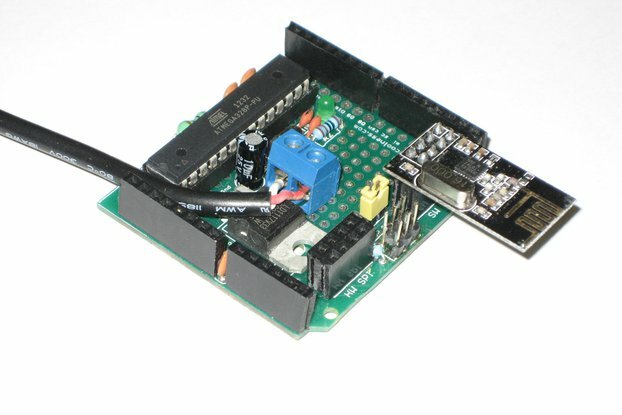 So lots of flexibility and configuration options with this carrier board! 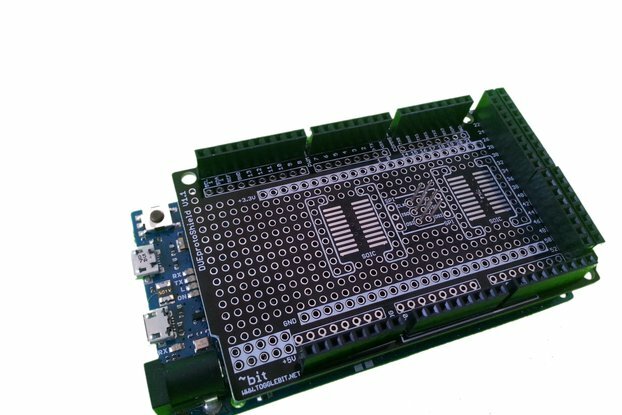 Combined with the generous prototyping area, this can make deploying of nRF24L01+ enabled projects using a Nano 3.0 faster and neater. Photos show populated board with 5V/16MHz Nano 3.0 clone and nRF24L01+ low-power radio module. Also shown with Arduino IO shield mounted with stackable headers, and TFT display shield mounted without stackable headers. (Note: Nano 3.0 and shields not included, shown for demonstration purposes). Shown beside Arduino Due and Leonardo for scale. 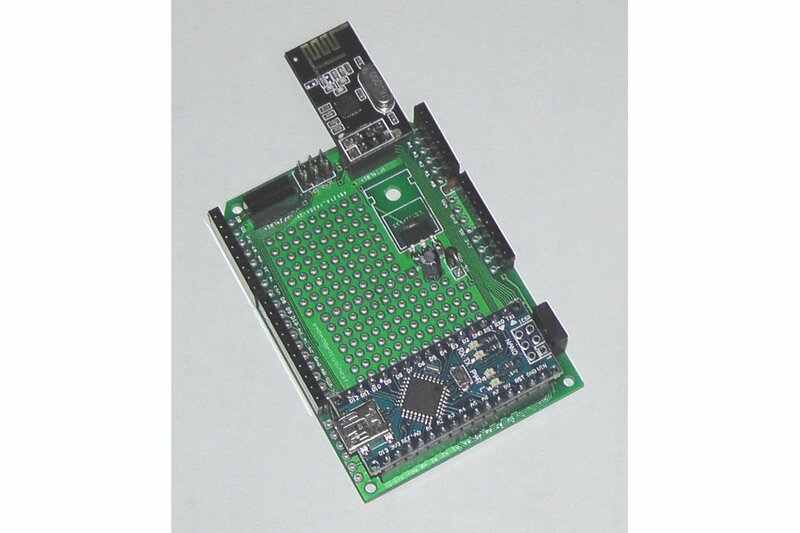 Finally, a low or high-power nRF24L01+ radio module can also be added as a kit option. Note that in kits, female pin headers supplied in 40-pin strips that need to be cut to length (all instructions supplied). Additional strip included in case of goofs!